There is so much misinformation, distortion and just plain ignorance out there today when it comes to Jews and their knowledge of Judaism and the Torah. Of course, one of the main reasons for this sad state of affairs is that most young Jews today are simply not getting a solid Jewish education. And this is true even in Israel, where you would think that they would at least know the basics  living as they do in the Holy Land. A former Israeli Minister of Education once went in to a public school in Tel Aviv to test the students' knowledge of the Bible. 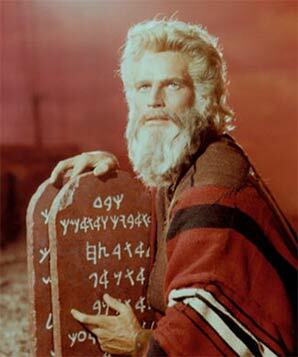 He asked one girl, "Do you know the Aseret Hadibrot [the Ten Commandments]?" To which the girl responded, "Sorry, but I never saw that seret (she thought he was asking about a seret, the Hebrew word for movie)". Pretty sad, eh? But I think that another major factor is contributing to the abysmal ignorance of an entire generation of young Jews. Many of them (and many of us) are getting a Jewish education  only that they are getting it in distorted form from Hollywood and the media. Last year I was teaching a class on campus and made reference to the Mormons. Three students called in out in unison, "Oh yeah, I know the Mormons ... I saw that South Park episode ... " Is watching South Park how the next generation is getting informed about world religions? And how many Jews now consider themselves experts in the very complex field of Jewish medical ethics because they saw a ridiculous Grey's Anatomy episode about the religious girl who refused a pig valve transplant because it's not kosher??? Now, this is not to say that there aren't serious students of religion. Of course there are. But there's no doubt that the masses are being impacted negatively  if unknowingly  by these distorted depictions. Probably the greatest culprit of all  which has caused a distortion of Judaism of Biblical proportions  is the 1956 film The Ten Commandments directed by Cecil B. DeMille and starring Charlton Heston (may he rest in peace) as Moses and Yul Brynner as Pharaoh. I would think it's safe to say that most Jews' primary knowledge of the Exodus from Egypt and the Receiving of the Torah at Mount Sinai comes from that movie. Which is kind of tragic  especially since Cecil B. DeMille apparently never consulted the Bible before making the movie! Ask most Jews today, "Who did G-d give the Torah to at Mount Sinai?" They will likely reply, "G-d gave the Torah to Moses." "And what were the Jewish people doing while Moses was receiving the Torah?" ... ... "Worshipping the Golden Calf." That may be how it happened in the movie  but the version found in the Torah is quite different. The Torah's claim is that the entire people heard G-d speak at Mount Sinai, experiencing national revelation. G-d did not just appear to Moses in a private rendezvous; He appeared to everyone, some 3 million people. And this seemingly small piece of "misinformation" about what the Bible really says has some really huge ramifications. "So that they may serve Me" ??? Did I catch that correctly, Rabbi? Do you mean to tell me that according to the Book version the freedom that the Jews enjoyed during the Exodus  and about which we celebrate till this very day on the holiday of Passover  wasn't merely freedom from slavery and building pyramids but was actually the freedom to go and serve G-d and spiritually grow through the 613 commandments that He gave us 49 days later at the foot of Mount Sinai??? No one ever taught me that in Hebrew School!!! You see my point with all this, I hope. Clearly, if we are to educate ourselves and our kids about Torah and Judaism, the movies are simply not the best way to do it. We need to go to the source to find out what freedom really is  and isn't. Passover is a few days away. It celebrates liberation and freedom. So it's a good time for all of us to let Charlton Heston go ... to liberate ourselves from the media-driven distortions and self-imposed ignorance that shackle us down and limit us as Jews  and to start learning about our beautiful history and religion in a more sophisticated and informed manner. This way, we will raise a generation of proud, educated Jews  something we need now more than ever. Rabbi Dovid Zauderer is a Toronto-based college outreach rabbi. Comment by clicking here.